A sampling of New Milford’s badges. When Laura Fleming, librarian at New Milford (NJ) High School, started her school’s PL badging platform in 2012, there weren’t many options to develop an open badging system. But that didn’t stop her. Fleming built a website in WordPress and then discovered Credly, an end-to-end solution for creating, issuing, and managing digital credentials that has a free WordPress plug-in. New Milford’s badging platform is all about how teachers integrate Web 2.0 and online tools into their instruction. Fleming intentionally kept the number of badges small—launching one new badge at a time—so that teachers never felt overwhelmed. She also started with tools that have a very low barrier of entry, like Wordle. “Each badge is quick and easy to learn, which is the point,” says Fleming. “Once teachers learn a tool, they log in and submit evidence that they have integrated their learning into their instruction.” Fleming evaluates the evidence and either helps the teacher fine-tune or issues the badge. Evidence can range from a lesson plan describing how they use the tool to photos of the tool in action or samples of student work. Fleming says some teachers submit narratives because that makes the most sense. The badging campaign has been incredibly successful. When Fleming started tweeting about it five years ago, the reaction was overwhelming. “I received more emails than ever in my life!” she says. “People were saying, ‘I want to do this, too!’” To help others get started, Fleming wrote “District Level Micro-Credentials” (worlds-of-learning.com/2016/04/27/district-level-micro-credentials/), an instructional blog post that includes downloadable files and a database. Once you install the files, Fleming’s framework pops up and lets you customize and create your own badging program. Pretty cool, huh? But creating the program is only the beginning. As Fleming says, you need to build an ecosystem so that people will be motivated to earn badges. “I wanted it to be both a safe place for those who are scared of technology and a challenging place for teachers who are tech-proficient. Everyone has the freedom to learn on the platform.” Teachers became enthusiastic about badging when they saw how serious she was about letting them learn. And even though it has turned into a district-wide initiative, teachers are not required to participate. When Rogers Middle School in Prosper, Texas, started a 1:1 Chromebook program in 2014, it was a challenge to train all 120 teachers how to use the devices effectively. Now that there are Chromebook carts at all ten Prosper ISD schools for grades 2 through 12, training the staff is even more demanding. “We had to come up with a way to provide PD without asking for more of a time commitment or stressing them out,” says Miranda Hansen, instructional technology specialist (ITS) for Prosper ISD. That’s how Michelle Phillips, lead district ITS, started a badging program. Once teachers started earning badges, everyone quickly got on board. “We had campus-to-campus competitions and a leader board on the website. The campus with the most badges earned in one week won prizes like being able to wear jeans to school,” says Hansen. Teachers who didn’t earn badges faced a little peer pressure, and pretty soon, there was no teacher without at least one badge. “Everyone—including office staff—saw the value of learning these tools, especially Google Docs,” she says. Badge competition is fierce amongst Prosper ISD teachers. Once the district had 200 Google-certified educators, Phillips and Hansen invited teachers to request additional badges, which included iPad apps, communication tools, Web tools, and assessment tools. 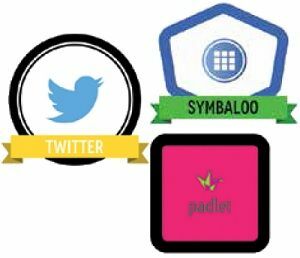 To earn these badges, teachers learned about a tool, used it in class, and submitted evidence of how they used it, such as a link to a student project and lesson plan, a video, or photos. Teachers also hosted their own Lunch ‘n’ Learns for their colleagues. Now that so many teachers have earned all 50 badges, the district has moved into phase two of its badging program. Starting with Google tools, teachers show how they’re using the tools at the SAMR levels and can earn an S for substitution, A for augmentation, M for modification, or R for redefinition. “Instead of handing out individual badges, we made a poster and give them stickers to display. Teachers go to each other for support as they go up the SAMR ladder,” says Hansen. PD sessions lead to badges. In 2014, when a new leadership team started at West Aurora (IL) School District 129, this team was not impressed with the PL offerings. “Most of it was one-stop, with no follow-up or results,” says Brent Raby, assistant superintendent of teaching and learning. “We had to tweak and modify if we wanted to make good teachers great.” He began offering one-hour, after-school sessions on topics like balanced literacy, Next Generation Science Standards, and tech integration, and he received great feedback from the thousands of teachers who participated. To his delight, teachers requested for the classes to go deeper. Next, the team used key pieces of the Danielson Framework to develop a series of 15 face-to-face classes that cover instructional practice, assessment, whole child, English language learners, and technology integration. Then they created a badging structure. Every badge is divided into 100-, 200-, and 300-level classes and includes five essential learning outcomes. Classes are offered throughout the year and during the summer, and teachers can take classes in any order. After finishing the classes in one area, teachers complete a research project and show their work to prove they understand the concept. “Every district I’ve worked in speaks a different language,” says Raby. “The beauty of our badging program is that we all speak a common instructional language now.” To encourage collaboration, an online database shows who’s earned which badge so teachers can direct their questions to the right colleagues. Last year, the first year of the digital badge program, 37 staff members earned a badge. The district prints fatheads for badge earners; they also earn feathers that they display in their classrooms. At first, the district ran the program by hand, but now they use the Performance Matters platform, which includes tools for student assessment and PD. “It has a slick micro-credentialing program that lets teachers add badges to their to-do lists and then see which courses they need to take,” says Raby.